“It is no understatement to say that working with Amy has been life changing for me. She has given me the tools and perspective I needed to take back control of my life. I feel energised, confident and relaxed. Amy has worked with me in relation to a number of areas all with successful outcomes. She is highly talented, empathetic (though challenging where necessary) and totally professional. Best money I have ever invested. Thanks.” J.B.
“I had been overweight for years and had restarted various slimming clubs over and over, never meeting with lasting success. After a friend told me of how she had overcome public speaking nerves with Hypnotherapy I considered it for myself. It turns out to have been a life changing decision as seven months down the line I am already 2 and a half stone lighter. My confidence is vastly improved and I have made changes in my life that I never thought would have materialized. I was nominated as ‘Woman of The Year’ at my slimming club… me! So, thanks to Amy, my Hypnotherapist, and her layering of positivity during my treatments I am a new person, a better version of me.” N.H.
“Amy helped me conquer my huge anxiety of feeling unworthy and incapable. With her help I was able to gain confidence for my driving test (which I almost certainly would have cancelled otherwise) and pass it first time! Amy is calm and patient, and because of this I never felt uncomfortable or uneasy during the sessions. Thankyou Amy!! !” E.S. “I sought help for confidence and anxiety issues from increased responsibility at work and certain private life situations. Before I started the sessions, I had impending presentations to give at a global company conference. Based on my personal view of my performance on previous presentations, I was not looking forward to them and felt myself get anxious and nervous just at the thought of them. In the past I’d feel my voice tremor, beads of sweat appear on my forehead and generally doubt my own ability. Now I am confident in my approach, my ability, presentation skills and everything in my life.The presentations I had to do went great and I even got positive feedback and asked to attend and speak at more conferences. My work life and private life have improved so much. I feel great. Thank you Amy.” M.L. “I had started to feel increasingly negative about work and would catch myself making cynical remarks or pouring cold water on others’ ideas. I was also becoming more anxious about life in general with the effect of life and it’s opportunities seeming to shrink. I would sometimes wake up in the middle of the night and not be able to get back to sleep properly, worrying about all sorts of random things. I had considered hypnosis before but was not really convinced that it could work for something like negativity. I had 3 sessions but by the end of the first one I felt amazing. It is hard to describe but it is like I was viewing the world through a pane of glass that was covered in dust and fog although I could not see the dust and fog. Hypnosis has cleared the glass completely, as if it is no longer there, the world is still exactly the same but it is clearer, brighter, more inviting. Another description is that I feel lighter, much more relaxed, very positive but in a calm, determined, resourceful way. It is as if I was living under a dark, wet blanket and now that has been removed I can see the world and all it’s possibilities in beautiful colour and light. I am the same person but am much calmer, positive, relaxed and optimistic. The anxiety has gone and I hardly ever say anything negative and do not often think negatively either.” K.F. 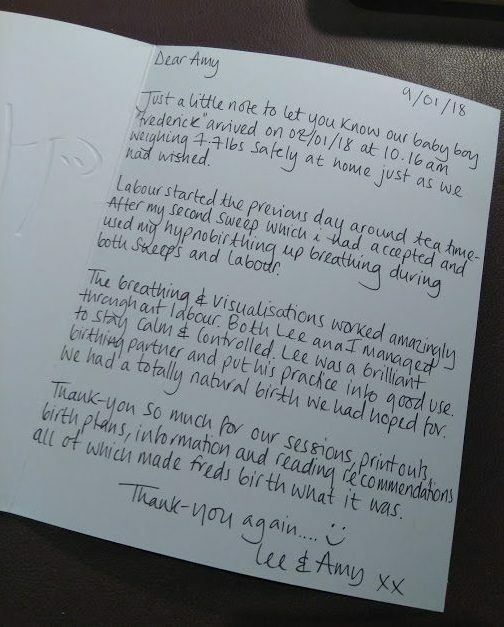 Hypnobirthing – a calm, positive home birth thank you. Just a little not to let you know our baby boy arrived on 02/01/18 at 10.16am weighng 7.7lbs safely at home just as we had wished. Labour started the previous day around tea time – aftermy second sweep which I had accepted and used my hypnobreathing up breathing during both sweeps and labour. The breathing and visualisations worked amazingly throughout labour. Both Lee and I managed to stay calm and controlled. Lee was a brilliant birthing partner and put his practice into good use. We had a totally natural birth just as we had hoped for. Thank you so much for our sessions, print outs, birth plans, information and reading recommendations all of which made Fred’s birth what it was. “I just wanted to drop you an email to update you since my last appointment. I am pleased to say that the gambling is now completely under control and I now have money in the bank! I am actually looking to remortgage which isn’t something I could have even considered before coming to see you. I really can’t thank you enough and I have even recommended you to a couple of friends.” G.S. “I had never experienced hypnosis before, but Amy is most professional and immediately puts you at ease. The whole sessions were calm and relaxed. Having arrived with my world in turmoil, then to feel an enormous weight had been lifted from me by the end, I will be forever grateful. Certainly to be recommended, my thanks always.” J.S. “Thank you so much for yesterdays session. I have already noticed a difference!! I went to the supermarket that evening and felt so much more at ease also since the session whenever I have thought about doing an OCD action I’ve managed to tell myself not to every time. I also went to a pantomime today surrounded by family friends and for the first time I was comfortable and didn’t feel nervous or on edge. Coincidentally the song I mentioned I couldn’t listen to came on in the pantomime and its the first time I’ve not left and have actually listened to the song in about 10 years.” M.G. This is a voicemail testimonial. 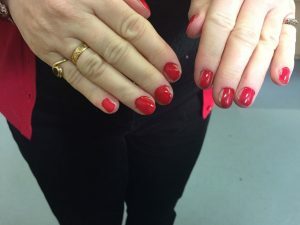 After 45 years of consistant, unconscious night time nail biting (nothing ever in the day) and using tape, and other methods, to unsuccessfully prevent habit, L.C. finally moved on. ” Since Monday I have been taking & making endless phone calls and made my first client phone call in over 12 months to someone who X describes as our most difficult client! I can’t thank you enough, it’s the one thing that has been stopping me from being 100% happy and coming to see you has made that happen!” C.P. “I would like to thank Amy for everything she has done working with me!! After working with other hypnotherapists, she has easily been the most unstanding and easiest to get on with! I would recommend her for any problems no matter how big or small! A breath of positive, contagious energy! Thank you.” T.B. “Amy Brown of The Power of your Mind Hypnotherapy has done so much to help me in the sessions I had with her. 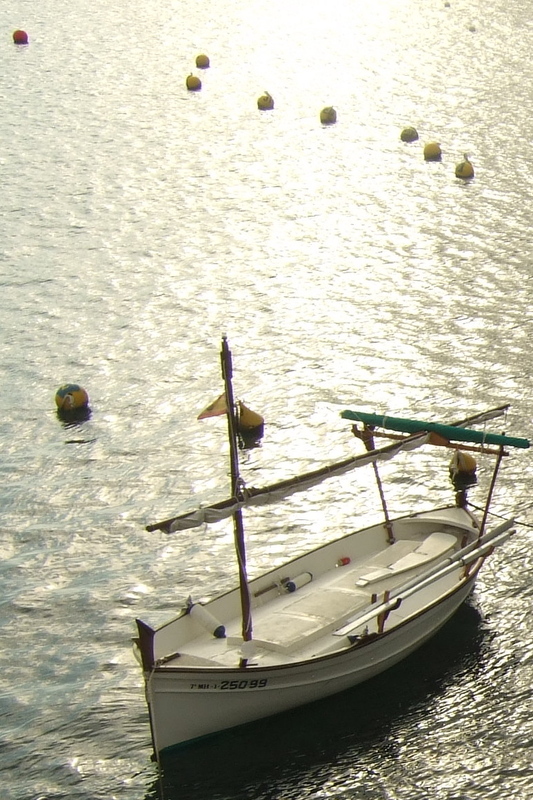 I was afraid of water and wanted to learn to swim (I’m 63). Amy helped me to have confidence and I have now been swimming on holiday which is a huge step for me. In addition, Amy picked up on something bothering me during these sessions that I wasn’t even aware of. Her help and guidance has allowed me to move on with my life after a bereavement for which I will be eternally grateful.” S.A.
“Since having my children and with the pressures of every day life, I had become very anxious, to the point I felt I was not functioning effectively. After three sessions with Amy I now have the tools to tune out the anxiety and feel more comfortable in my own skin. I still worry from time to time but find it much easier to put things in perspective. Amy has a wonderful calming manner and her techniques are very effective. I can’t recommend The Power of your Mind highly enough.” A.G.
“Never considered this therapy before but felt immediately at ease in the peaceful atmosphere of Amy’s consulting room. Very empathetic, Amy helped me give the right amount of information so that she could discover the reason for my fear of driving. After only two sessions I felt more confident and able to drive home, and continue to improve enough to buy my own car shortly.” J.J.
“I would recommend Amy; she was very confident dealing with my issue and put me at ease. I am definitely trying more foods than I have ever tried before, I now feel I can try something new. It is like it has allowed the psychological block to come down. The sessions made me feel calm and left me with a positive feeling.” H.T. “I have met with Amy for hypnotherapy to help with anxiety and a fear of giving presentations, which is going to be a requirement of my job. Before hypnotherapy I really did think these were problems that could not be resolved. The sessions were very relaxing and Amy made me feel very comfortable and listened to. The sessions have truly helped me to feel more at ease with myself and realise that my limiting beliefs (which I think included a fear of success) were holding me back, and it is possible to do anything I put my mind to.” A.H.
“Having never had hypnosis before I was sceptical at first but would now recommend it to anyone. It has helped me immeasurably and Amy provided me with many techniques I can use to help me in everyday life. Amy puts you at ease straight away so that you immediately feel comfortable. I have really enjoyed this experience and have left feeling far more confident than I ever thought possible.” B.M. “I would highly recommend Amy to anyone as I had such a positive experience. Having struggled with a fear of flying for many years (and having tried many different types of treatment already) I was very interested to work with Amy and see if she was able to offer any techniques to overcome the anxiety and panic I feel on a flight. In fact, the sessions I did with Amy have actually hugely improved my levels of anxiety in everyday life. I found the whole experience to be hugely positive and the sessions have taught me how to manage stress and how to keep a clear mind when things becomes too chaotic – so a massive thank you! I also found the sessions very relaxing and restorative.” N.T. “This was my first experience of hypnotherapy and I found it invaluable. Amy takes time to really understand you and why you feel the way you do. After having children and not working for several years, I felt I no longer had the confidence in my abilities to approach potential clients for work. Amy used a combination of practical techniques and hypnosis with different tones of voice to help me re-build my self esteem and alleviate the anxiety I was experiencing. I now have a much more positive approach, feel much calmer and less intimidated. I can’t thank you enough Amy.” N.D.
“I want to say how much I have appreciated the help you have given me over the last few months. I definitely feel that the therapy you have given me has made me a stronger person, more able to deal with life’s anxieties. I was unsure of myself & doubted my capabilities. With your understanding of my circumstances I have become able to focus on the positives & not let the negativity get in the way. For this I will be ever grateful.” J.F. “I came to see Amy for help with public speaking. I was planning to speak at a charity function I was organising, about a subject that was very emotional for me. As the event approached I found I was so worried about speaking that I was no longer looking forward to the big day. My time with Amy was hugely calming. After hypnosis I found that my confidence grew and grew and the dread I was feeling was completely eased. I really enjoyed giving the speech that night and received a standing ovation. I’m still smiling about it. Thank you so much Amy.” J.H.